There has been some uncertainty in markets recently, with many believing that markets are fully valued, expensive and lacking opportunities. That's the danger you face if you look at markets as a whole. But when you look 'under the hood', there are plenty of high-conviction opportunities. Here we look at three specific opportunities we have implemented in AMP Capital's ASX-listed Dynamic Markets Fund, DMKT. To provide some perspective, the blue line in the chart below shows the relative performance of the global energy sector, and the orange line shows oil prices. Understandably, the global energy sector went through quite a significant cleansing process in 2014/2015 as the oil prices came under pressure, and also during the time that we had worries around the Fed and US dollar. When you have a downtrend like that, you don't pick a fight, you wait for it to exhaust itself and present an opportunity. 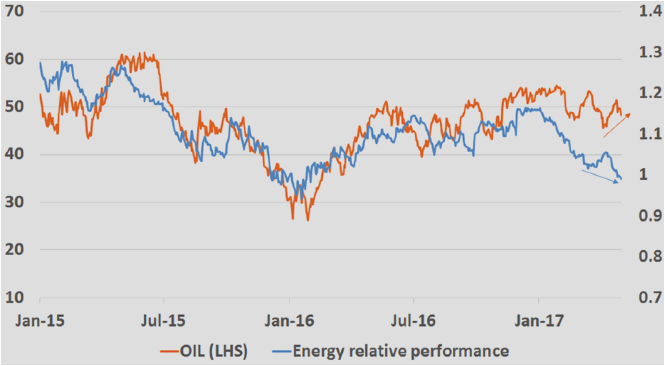 However, while the global energy relative performance has made a new low, oil prices have not. In effect, the global energy sector is now trading as though oil prices are in mid-20's. However, the oil price is now around $46, so that is quite a disconnect. That's not the only story though. If you look at the chart below, which demonstrates which sectors have seen the greatest earnings revisions over the last three months, you will see earnings of the global energy sector appear to be improving. Energy actually ranks fourth when it comes to the revision ratios, and comes despite the ongoing weakness in the sector. So we have a sector that has a lot of room to mean revert on the offside, it's relatively cheap, and it's showing lots of positive convergences that suggest that the period of underperformance is likely to reverse. In implementing our ideas however, we don't want to have stock specific risk. When you talk about the global energy sector, we don't want to buy Exxon or other specific energy companies, because individual companies come with stock specific risk. A company can be cheap for a reason, but that's not necessarily the case for the whole sector, so we implement our ideas at a sector-basket level. For example, we use a Vanguard global energy ETF, which is a good basket of global energy stocks. That helps us get access to the sector themes, without taking the stock-specific risk. The second opportunity I would like to discuss today is within agricultural commodities. They trade on their own fundamentals, and wheat is probably the highest conviction part of the agricultural market, so let’s have a look at that. Let's start with some perspective. 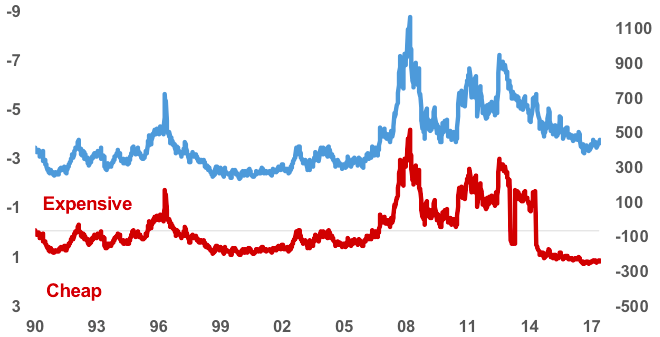 The blue line shows the price of wheat since 1990. In mean reversion terms, you can see wheat prices are trading towards historical lows. The red line shows a valuation measure for that commodity, and when prices are very low relative to cost of production, you have a cheap valuation sequence. As you can see, price to cost of production for wheat is at historical lows, and this is due to global production. 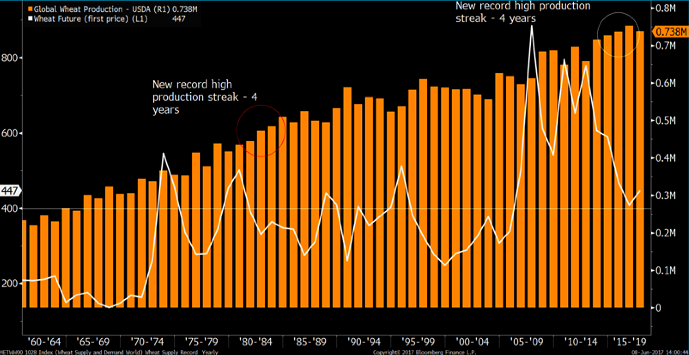 In the next chart, the orange bars show the annual production for wheat. When you have increasing production for a number of years, this applies pressure on prices. And as they say, ‘The cure for low commodity prices is low commodity prices’. So when production increases, causing prices to drop, it's not worthwhile for farmers to plant wheat anymore. Historically, it's rare that we see four years in a row of increasing production, in fact, the latest report by the US Department of Agriculture showed that farmers have cut back wheat plantation to the lowest on record and already we are seeing some response to falling prices. The last time we had a situation like this was in 2012, where production dropped by 5% and prices rallied about 19%. And back in 2010, we had a 5.5% drop in production and prices climbed 47%. So far this month, agricultural commodities have been a strong value-add, and if history is any guide, we should see prices rally 20-50%. Global shipping and transportation markets - in fact the entire industrial part of the market - underperformed for several years because of worries around global growth, the slowdown in China, and the fall in global trade in 2014/15. The context is different now, and is a lot more broad-based. Some of our global growth diffusion indicators, which we'll look at for accessing where we are in the economic cycle, are at multi-year highs and the underlying trend is very strong. Global trade has rebounded quite strongly, led by Asia, yet when you look at the valuation of some of those trade-sensitive transportation stocks, you can see there are sectors trading at levels which last occurred during the Asian crisis in 97-98. We don't want to buy sectors that are cheap and get cheaper. The only time you get interested in a cheap contrarian thing is when the fundamentals become ‘less bad’, which is what we're seeing in global transportation and shipping areas. For global shipping, we have an allocation to the Guggenheim Global shipping ETF, and in the US, the VanEyk US transportation ETF.